I truly believe that women can wear whatever they want. If it makes you happy, makes you feel good, rock it. My posts are guidelines for those who desire it, and today’s post is how to wear graphic t-shirts. Graphics tees have become a strong trend in the past few seasons and it’s only getting stronger with the politics in the US and other parts of the globe. Wearing a graphic t-shirt is a way to express ourselves without saying a word. Through our choice of graphic t-shirt, we can showcase our favorite band, TV show, book, political party, or belief. However, not all graphic tees are created equal. 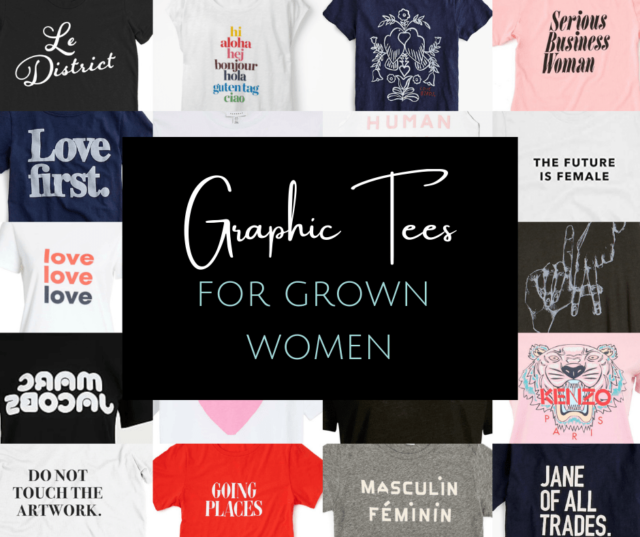 Below I share great graphic tees for grown women: tees that are stylish, sophisticated, but not at all boring. Whether it’s your political views or a social cause you care about, there’s likely a cool-looking shirt out there representing it. Even better, often these shirts donation a portion to a charity or organization that supports your views. Such shirts can be worn with your leggings to the gym or slipped under a blazer and tucked into jeans for a networking happy hour. To ensure such versatility, keep the color relatively neutral and the print clean and clear. Words and smaller graphics will get more mileage than a giant silkscreened pattern. While I’m not big on “inspirational speaker” t-shirts (see below), there are plenty of graphic t-shirts that share a word or short phrase that may speak to who you are as a person, your style, or how you live your life. I have this shirt from J. Crew and feel it fits my life pretty well. I’ve worn it tucked into skirts, half tucked into denim shorts, and paired with white jeans and blazers. If you’re a Francophile you may enjoy a shirt with a French word on it (and you're lucky because I'm finding such shirts at almost every retailer); if you’re dedicated to your yoga practice you may like a shirt that says Namaste (there's plenty of great ones at Etsy). A big trend this season is graphic tees representing cities and states; everyone from Target to Neiman Marcus has options in a variety of colors and styles. Graphic tees are a great way to show your great loves. A well-worn band tee shirt is eternally chic, tucked into a leather pencil skirt or paired with a pantsuit. A quote from your favorite book or author can look quite stylish in the right font on the right colored tee. When doing such shirts, be sure you are a true fan (see my tips below) and focus on classics, not trendy of-the-moment memes or TV shows so you’re not turning that tee into a dusting rag by summer. Whether it’s Kenzo or Keith Haring, RBG or Reddit; a graphic tee is a way to show your love of a brand, a product, or a person. Your favorite work of art, museum, newspaper, or designer usually has a stylish quality t-shirt available that will look great peeking out from your blazer or moto jacket. While I am not usually one to buy large logos and plaster them all over, fashion brand t-shirts can be quite stylish and cool looking. If you are a fan of a brand and can afford one of their t-shirts I see no reason why you shouldn’t elevate your t-shirt collection. Just be sure to baby it so it lasts (it may be a t-shirt but it’s not cheap) and don’t buy fakes (see below). Not every graphic tee has to be a billboard for a product or a bumper sticker proclaiming your life’s motto. Sometimes a graphic t-shirt is great just because it has a cool design on it. I have some t-shirts with word-free graphics on them that are decades old and still well-loved because such shirts are usually timeless. With such shirts, the fabric and silhouette are paramount (see below). What are you saying? A t-shirt is a way to express yourself without saying a word; is your shirt properly representing you? Do you wish your first impression to be about tacos, Mondays, wine, or brunch? You’re better than that. Consider graphic t-shirts to be the equivalent of a bumper sticker on your car or a tagline on your business card. Keep the funny sayings about coffee, men, and guacamole costing extra to your coffee mugs and Instagram memes. Don’t be a motivational speaker. If you have a kid in your life under the age of 16, you’ve likely noticed the trend of “motivational speaker” t-shirts. It’s a welcome change from t-shirts advertising TV shows, candy, and brands and is a way to ingrain positive thoughts into peers and the shirt-wearers themselves. It makes sense for kids who are still learning about themselves and the world around them; to see shirts saying BE YOURSELF and DREAM HIGHER THAN THE STARS can motivate them and have them think and see things with a new perspective. As adults, we can motivate through our words and actions; unless such shirts coordinate with your job or project they can ring hollow. If you don’t know it, don’t wear it. If you can’t name a handful of songs by the band, don’t wear the t-shirt. If you don’t watch the TV show, don’t wear a quote from it. If you haven’t visited the city or state, don’t wear it across your chest. T-shirts are a great way to start up a conversation and you don’t want to be left looking clueless. Live in the present, not the past. I hate to break it to you, grown women, but we're at the age where what we loved as teens and young adults is cool again. And you know what that means… time to let (most) of it go. If a 14-year-old is running around town in a FRIENDS sweatshirt or a Nirvana t-shirt, it's not cool for you to be doing the same. However, there is an exception. If you're some badass who never stopped wearing that Nirvana shirt, if the look is something that is ingrained as part of your personal style already, I say rock it with pride. For example, I have a decades-old well worn Ramones t-shirt. I don't plan on retiring it just because you can find a similar one at Forever 21. Don’t buy dupes. Dupes is a term from the beauty community; this drugstore blush has the same color, sparkle, and pigment as this fancy department store brand. Dupes do not exist in fashion; they are fakes, they are counterfeit, and they not only screw over the originator but they also are usually made in worse factory situations. If you can’t afford a Gucci t-shirt, don’t wear a Gucci t-shirt. Fakes are never fashionable and the fashionable can smell a fake a mile away. Fabric matters. While that shirt on Etsy or Zazzle may have a great message, what kind of fabric is it made from? It’s hard to tell online as 100% cotton could be as stiff as cardboard or have a nice drape. Look at reviews, find sites that show the t-shirt on a model, read descriptions looking for descriptive words like drape, soft, stretch, float, and skim that allude to a softer fabric. Fit matters. There’s a difference between that stiff boxy t-shirt you got from participating in a fun run and the tees sold at department stores and boutiques. Look for tees that work with, not against your body. Slimmer fits, styles that drape or have a bit of a fit and flare silhouette, sleeves that hit at a place on your arm that you like (usually having the end either above or below the widest part of your bust). These small details can make a big difference in how often you wear the shirt and how versatile it is with your wardrobe. If in doubt, size up. Often, graphic tees will shrink a bit. It’s better to have your shirt a little loose than too tight. It will give you room to tuck and knot. Also, there’s nothing wrong with having a t-shirt tailored. Every garment in your wardrobe including your t-shirts can benefit from being customized to fit your unique shape! Step away from the mall and get to your computer. Graphic tees are such a great way to show your personality, do you really want the same t-shirt as everyone else? Etsy is one of my favorite places for unique t-shirts. Thrift stores are a great place to find band and art tees. Instagram is a great way to find new-to-you indie brands that make artsy or message tee shirts, and often these smaller companies donate a portion of proceeds to charities. I have a few suggestions below. Consider color. That hot pink t-shirt is beautiful… but does it go with your wardrobe? If it’s a bold and bright color it may not be as versatile. Or if your wardrobe is primarily neutrals you may find a hot pink t-shirt exactly what your closet needs to feel cohesive. Basic t-shirt colors can also be higher maintenance; black can fade, white can get dingy or yellow under the arms. Just as I recommend with any other purchase, envision your graphic tee in three different outfits. Under a blazer with jeans, tucked into a skirt or pants, worn with leggings and a flannel or cardigan, half-tucked into shorts… you get the idea. I’ve found the hard way that black t-shirts get the least amount of wear in my closet. Quality, not quantity. You’re a grown woman with a full life and a full closet. You don’t need an entire drawer full of t-shirts. If you have a lot of tees that have sentimental value, that’s fine. Box them up, turn them into a quilt, frame them in the home office, make them into pillows. But when clothes are in a drawer, not only do we wear them when we know they’re not the best, they prevent us from buying the best. If you love graphic tees you may have a handful of them, but that’s all you need. More, and you become the Graphic Tee Lady versus the woman in a cool shirt. It’s better to have one or two great fitting, quality shirts that stylishly represent you than a pile of cheesy, faded, or meh shirts that don’t do you or your style justice. The Outrage: A DC-based woman-founded activist apparel shop and community space, The Outrage makes a donation to a progressive organization with every single purchase. Otherwild: Otherwild sells a variety of items including graphic t-shirts. They are committed to utilizing our resources to provide sustained support to grassroots and national social justice and health care organizations. District of Clothing: Founded in 2014, District of Clothing is a Black woman-founded DC-based company. While she carries many chic DC tees, she also has great shirts appropriate for people who live everywhere. I love this one, but note it runs small; I ordered an XL and it felt like a M. Follow the size charts and if you're larger, look at her unisex options. Fanny Karst: Are you a badass woman proud of your age? Think aging is an art? that old is the new black? Then this is the shop for you! The Home T: Ever since the company started, The Home T has donated 10% of their profits to the National Multiple Sclerosis Society and is specifically earmarked for research. I have one of their shirts, it's several years old, the silkscreening still rich, and the shirt is one of the softest I own. In fact, The Home T saw me on Instagram many years ago before I had many followers, heard about our family road trip and sent us three Maryland shirts for it, no strings attached. Museum shops: From The Whitney to The Met, art museums have in person and online shops full of very cool t-shirts and proceeds support the museum. UNIQLO: While many consider UNIQLO fast fashion, they do some phenomenal t-shirt collaborations. Whether you're into manga, Mickey Mouse, or modern artists you're likely to find a very cool shirt on their website. 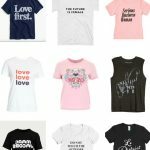 Do you have any suggestions on where to find great graphic tees for grown women? Do share them in the comments! There was a yoga studio near my old house in Long Beach, CA that sold shirts that said “Namaste, mother[bleep]er” except, you know, unbleeped. I still regret not buying one. It was so very much a sentiment OF Long Beach, encapsulating the attitude of the city perfectly. Plus it always made me laugh. I’m not sure I’d have a chance to wear it much in the Midwest, but damn, I’d try. I guess you could say that my t shirt choices veer towards the masculine, but that’s what I like. I can’t wear these shirts everywhere, but that’s OK. I like antique machinery of all kinds and just about anything having to do with transportation. I have a shirt with a line drawing of an antique tractor that I really like. I have another that says simply Boeing in bold type. I like all Boeing planes except for the composite ones and I wish I worked for them. Because I have shirts about what I am interested in, I can and will talk about what’s on the shirt until your eyes glaze over. I just don’t want to encourage people to stare at my chest. I understand and respect that you know your self and style so well! I’m planning to check out some of those Etsy links when i have more time tonight after work. J Crew has had some good ones lately. I bought the “Love First” one last year and wore it like crazy all summer with shorts. It was especially nice to have it on when I was going to certain places or dealing with certain people who I thought really needed that message. They’ve got another version of it out right now and it should be arriving on my doorstep one day soon. Thanks for the tips and for giving some good options to check out! Glad you liked it! And I agree, J. Crew is one of the best places for graphic tees! Really Allie? Don’t wear this saying, or that band, or heaven forbid, about something you are not familiar? WHO CARES. Honestly, I think the guy next to me in the post office line, or the woman behind me at the grocery store check out, the girl seated next to me on the El, or the stranger I pass on the street most probably has bigger fish to fry than to judge what I am wearing on my tee shirt. If the shirt fits, wear it. And if it doesn’t, then it can always be part of your jammies. Totally agree Melissa, which is why I started the post with, “I truly believe that women can wear whatever they want. If it makes you happy, makes you feel good, rock it. My posts are guidelines for those who desire it.” I say wear what you want, this advice is only for those who are seeking it. For people looking for book-inspired tees, I highly recommend Out Of Print! Thanks for sharing this resource! And that shirt sounds awesome!